Anna Stahl launched her career freelancing for television campaigns in London. From there she dove into creating fleeting vignettes and broadcasted her talents throughout shops and boutiques in New York City. She gained the nod of approval from NY Observer, NY Times, and Time Out Magazine. Consequently, she was hired by the creative director of world-renowned Bergdorf Goodman and merchandised the store’s famous holiday windows. Upon moving to San Francisco, she designed window displays for countless well-known companies, channeling traffic into their stores. With the birth of her children, Stahl changed her focus to designing kid’s bedrooms. Through hard work, original style, and a funky attitude, the designer developed her passion into a career and launched Nest Interior. Q. Hi Anna Stahl. Thanks for talking with us today. You went from being a window dresser to turning children’s rooms into personalized havens. How do you think designing window displays has helped shape your new career? A. Thank you for the opportunity to speak about kid design. What I loved about creating window displays was the sheer fantasy of it all, making found objects manifest into a meaningful vignette. Designing for kids made for an easy transition, as there is a lot of crossover in thought process. It's about choosing the right "props" (such as a great vintage table or interesting quilt) and downsizing the things you don't want to see (read: plastic and clutter!) and then of course, fantastic graphics and/ or colors always seems to help. Q. In the nursery you designed, instead of the customary soft pastels or even the common primary colors, you chose bold, more adult shades. Do you think color influences the development of a child’s personality? A. Hmm, good question! I know for sure that color effects mood but am not sure about how design weighs in child development. That said, it makes sense that building a cozy and safe setting you are also bolstering a child's sense of self. We’ll leave the answer of that question for the shrinks J. Kids are just like us; they want a place to be comfortable and secure, surrounded by what makes them happy. Q. With your love of bright, bold colors, how difficult is it to put aside your own interests in order to design a room based on the homeowner’s likes? A. Not at all. What I create is not everyone's cup of tea! I aim to create spaces that flow with a client's own style and general aesthetic. Most of my clients are very tame in comparison to my style and that's OK. The kick I get is from seeing people happy and confident with their choices. Clients that seek advice tend to know what they are looking for but just need that extra soundboard to bounce ideas and/or pull the look together. However, I do LOVE the client that says, "I have no idea, we trust you, go to town!!" Q. You have a talent for seeing possibilities in other’s castoffs. Do you have a favorite place to shop for such pieces? Q. On your website, Nest Interior, you said: “It's so fulfilling to take a child and make a room based on their personality.” Do you have a process for determining a child’s personality and then translating that into a design? A. There is a certain process, yes. Meeting the children and trying to get a grasp of their persona is key. I try to steer away from train themes for Johnny or purple for Suzy. We as parents know, those phases are all too fleeting. I also try to take into account kids habits (need for an area to create art, love for a cozy reading spot) as well as those of parents (preventing clutter and optimizing space). Q. Having lived in London, New York City, and San Francisco, all very cosmopolitan cities, how does your style reflect the sophistication of those cities? A. I think all three cities have an essence of making fashion, art and design seem so fabulous and effortless. I strive for that but in actuality it's real labor for me to achieve because I really do obsess to get it all just right in my mind. I think living in different environments has opened my mind to various nuances. In a personal way, London was about cultivating epic style. For a country girl from upstate New York it was the revolution I'd been looking for. Later on in Manhattan it was learning to mismatch funk and make it chic. And in San Francisco I learned about the importance of integrating texture. Q. After taking time off to raise your family, which then resulted in a new design career direction, have you ever been tempted to return to window dressing? A. I love window dressing!!! Comically enough, my degree was in Sociology and I find it so interesting what window designs as ideas, convey to the general public. They are stories, social statements, and art all wrapped into one. I especially loved working with thrift windows because there was such free reign with available objects. Some vignettes would just happen into place and somehow convey a certain story. People would constantly stop to ask what exactly was I trying to say with my work. Was it political? Was it rhetorical? Or was it just nonsense that was supposed to be pretty? Great fun, good times! Q. Have you ever had a client present you with a favorite piece of art or furniture and ask you to decorate a room around that piece of inspiration? And how difficult is it for you to translate a client’s vision into reality? A. I find more often than not that people are lacking the inspirational piece! They have no clue where to begin and that's when the detective hat has comes out. At other times, people will have a special print or item that they want incorporated into the design and that's very helpful! It tells me about their style and gives a hint for which direction to go on. Q. Have you ever been asked to design a room for two children of vastly different ages? What did you find was the most challenging aspect of that particular design? If you’ve never faced that challenge, how would you handle designing a room shared by a tween and toddler? A. I currently have a situation like that. I think the primary focus should be to create a gender/age neutral zone but also have areas that are personal for each child. How I'm attacking the current situation is by having bold colors for each in the same tonal family—a lime green for the five year old girl and teal blue for the 10 year old boy. These two bolds are bound by a neutral base of charcoal and white, with pops of orange for the boy, and pops of yellow for the girl. Also, in this case wood tones are similar to streamline the room because space is tight. And tight space leads to my biggest recommendation...STORAGE! Got clutter? Hide it! It feels good not to see it, believe me! Q. What do you foresee in your design future? A. Well, I do feel my business is picking up again. I actually have more adult design work than kids so my hope is with the mending economy people will go back to such luxuries as hiring designers to create wild spaces for their children! 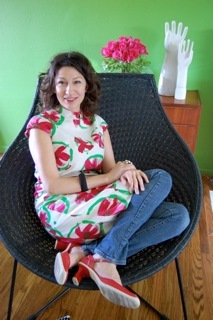 Thanks to Anna for taking time to do interview for our Cool Kids Rooms site. Visit www.nestinterior.com for more great kid's rooms ideas and contact info. Do you have a questions or comment? Share it!